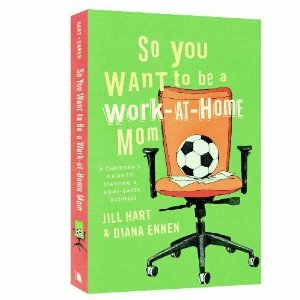 When I began to thumb through “So You Want to be a Work-at-Home Mom” by Jill Hart & Diana Ennem all I could think was “where was this book thirty-some years ago when I was a stay-at-home wife and mother?” I instantly knew I wanted to pass the information it contains on to my daughter-in-law and apply what I learned to my writing adventure. Jill and Diana guide women—Christian or not—through the decision making process of running a home-based business to types of enterprises to consider. They didn’t miss a beat when they talk about marketing and networking. They suggest creative ideas for office space with an activity place for the kids. And they didn’t forget about the necessary disciplines of time management, bookkeeping, and record-maintenance for making it a successful venture. However, I kept wishing they had put the basic marketing information in the chapter with reference to an appendix for details. Nevertheless, the valuable information is all there for working at home.